Spanning three decades against the backdrop of the Jewish community in Winnipeg, Holding My Breath is a poignant coming-of-age tale told from the point of view of Beth Levy, the youngest in a household of two generations of strong Jewish women. There’s her mother, Goldie, who upholds the middle-class values and traditions at home and in the community; her aunt Carrie, who never married and carries a secret, tragic past; and her youngest aunt, Sarah, the most beautiful, wild and rebellious of the three sisters. Noticeably absent is her uncle, Phil, who died tragically during the Second World War. As Beth grows up, she finds herself navigating between the old world and the new, and the mounting pressure to conform feeds her longing to escape. A bold and tender debut novel from a fresh and exciting new voice. Ludwig’s setting, the North End of Winnipeg, is richly drawn without intruding on the calm, quiet story…. Ludwig has the gifts to launch beyond the predictable. A polished work from a new voice in Canadian literature. Ludwig creates a group of characters who are complex, strong and distinct…. Her sensitive and detailed exploration of character, combined with her skill at evoking the specificities of time and place, create something to which everyone can relate. Ludwig captures the complexities of love, as it relates to personal happiness but also responsibility to family, friends and community. She has a talent for dialogue and manages to communicate the feeling garnered by those uncomfortable moments we’ve all experienced when something awkward is said and people flounder to find a response. While this is Ludwig’s first novel, she has had short fiction published in several magazines and anthologies and she is the recipient of the Canadian Author and Bookman First Prize for Most Promising New Writer. Much-deserved honours, indeed. Holding My Breath is calm and absorbing, its themes handled with delicacy. The writing is precise and each lyrical moment is earned. [A] nicely observed debut… charming. Ludwig’s honest, clear writing and patient, compassionate observations render the characters and their insular world entirely believable. Impressive… Ludwig tells an absorbing story, and we look forward to hearing more from this young writer. 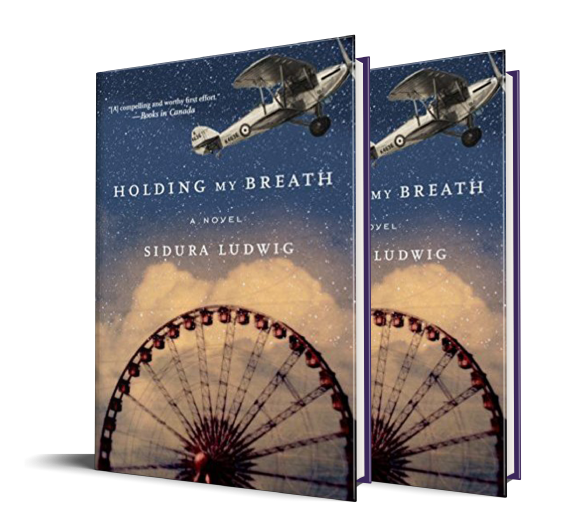 This is much to admire in Sidura Ludwig’s debut novel, Holding My Breath, a coming-of-age story set in the mid-20th century: its powerful evocation of setting, compelling cast of complex female characters and affirming celebration of Jewish family life. 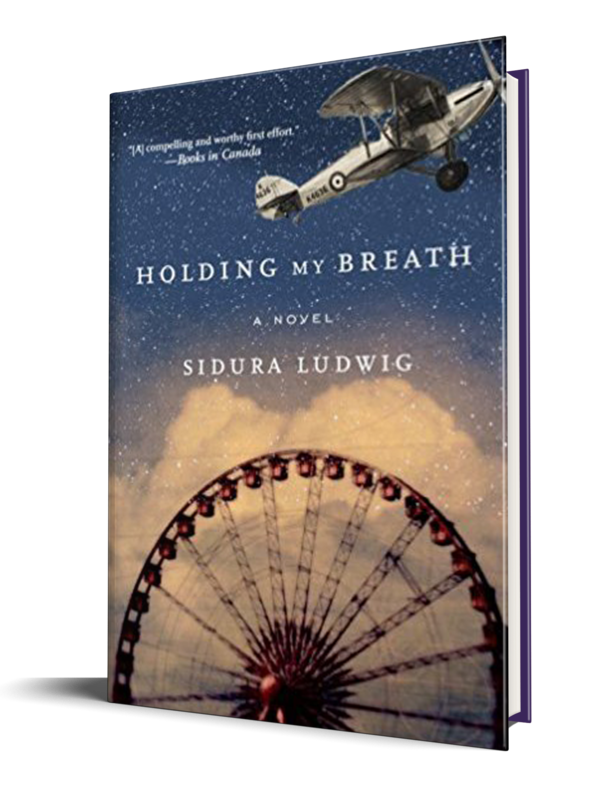 Holding My Breath is a skillful exploration of one Jewish family in the North End of Winnipeg during the aftermath of the Second World War… Ludwig deftly weaves historical markers and references to Winnipeg into the story, allowing the reader to focus on the characters, their ambitions, triumphs and tragedies. Holding My Breath is a polished and satisfying novel. Quietly compelling… Ludwig explores the universal conflict between individual needs and family ties with sympathy and compassion. Beth, our delightful narrator, stakes her own claim early on, and the reader is instantly smitten. Holding My Breath is a sweet, sad, and compulsively readable tale that manages, along with its lovely, unbreakable characters, to soar. This is a portrait of an era, a city, a family a story lovingly told by a girl born into Winnipeg’s postwar Jewish community…. Here are three sisters… seen through the eyes of a daughter torn between familial devotion and restless, brilliant ambition. This novel depicts the tremendous capacity for love and the sometimes tragic tendency to hold our loved ones too tight. Click on the button to purchase your copy of Holding My Breath.